The present terms and conditions are valid for several contracts as well as related agreements between 360 decoro and the customer (either closed via e-commerce or other ways) as long as there are no other legal conditions in contradiction to these conditions. Those terms and conditions are always applicable in their current version and for future business. Any other agreement has to be concluded on a written basis. The customer or partner resigns to claim its own general terms and conditions. We basically close contracts with customers that are natural and legally competent persons according to law, elder than 18 years old or legal entities (continuously called „customers“). In case a contract was signed with any other people not belonging to one of those categories, 360 decoro is entitled to rescind the contract within a limited time. Further, our offers are subject to confirmation and do not force us to deliver. Orders are obliged after a clear confirmation or an actual delivery and conducted service. The customer resigns to claim a declaration of acceptance according to the corresponding law. 3.1 Prices listed on websites as well as any other statements concerning products and prices are non-obligatory und subject to change at any time. All mentioned prices do not include tax, insurance, packaging and delivery. 3.2 In case any wrong announcements in reference to products and prices have been made after the confirmation of the order, 360 decoro is allowed to rescind the contract within two weeks. This is not applicable if the customer confirms and agrees on the renewed conditions. All documents and files of the customer in order to be able to process the order are provided on the risk of the customer. We are not obliged to offer insurance for neither the documents nor the final products. Further, we reserve our right to control and also reject the provided documents or files without giving reasons. If the customer fails in delivering the appropriate material for further processing in time and in an adequate manner and 360 decoro is therefore not able to process the order, nevertheless we reserve our right to profit. Additionally, given delivery dates are not binding in terms of production of advertisments, printing or interior design products. The customer is entitled to rescind the contract after setting an additional respite of 4 weeks. If the delay is caused by slight fault, the cancellation of the contract is not possible. Anyway, we are not liable for damages and costs emerging from delayed deliveries unless we made a clear delivery date announcement before and failed intentionally or due to gross fault. We are not obliged to store all kind of documents, files and products provided by the client. On the written demand of the customer we send them all back within a month. Otherwise we are entitled to throw them away after the expiration of the time limit. Further, we are not obligated to check the content of the delivered advertising materials and proof their legal validity. The customer declares that he possesses the necessary copyrights of the material provided to 360 decoro and allows 360 decoro to use and process with them. Further, the customer states that the handling and diffusion of the material does not infringe competition regulations. The customer also undertakes to not prosecute 360 decoro in any way in case the customer has violated those regulations. All kind of costs emerging from this violation – including costs for legal prosecution – have to be repayed to 360 decoro by the customer. We are not liable for any faults and problems occuring when advertising material or finished products are going to be delivered via electronic devices. In order to be able to judge whether the order was processed successfully, the actual state of the material when arriving on our servers or sending from our servers is crucial. Any ideas and products as well as graphic design developped by 360 decoro underlie the copyright of this company. On demand and by paying an appropriate license fee, the customer obtains a license for further usage and diffusion of our products. For any jobs that are not going to be implemented in the end, the customer is obligated to refund costs. By paying this fee the customer does not obtain any rights. Concepts and drafts have to be given back immediately. 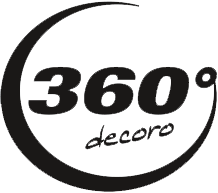 In case the presented ideas and products are not going to be used by the customer, 360 decoro is entitled to sell and use them for other projects and orders. We are entitled to quote our company or the owner of the copyright on all advertising materials without the customer’s approval and his right to compensation. The customer accepts that we do not expulse any competitors or harm competition. In addition, we point out that we can not be made responsible for materials supplied by the customer. We are not liable for damages, breaks and any other visible subsequences. In these cases the customer is not entitled to claim damage compensation. Intangible damage cannot be claimed at any time. We are liable for any damages that have been caused through gross fault or on purpose if the customer is able to provide evidence. In these cases, our liability is limited to those damages that typically occur in the corresponding constellation. The maximum limit of the damage can be normally predicted in advance and the customer agrees that the damage will not exceed 7.500€. Damage claims due to product liabilities as well as duties of replacement and costs of installation, travelling and delivery cannot be claimed. We are just liable for our own production which does not include further costs and additional expenses of installation. If we manufacture or print materials provided by our customer, we do not take over responsibility for damage, break or the result of the print. If original documents or materials of the customer are destroyed due to technical problems of machines, we are obliged to replace the raw material but are not held repsonsible for any production costs of the provided files or materials themselves. In addition, we do not take over responsibility for duties of the customer in terms of discipline. The customer is responsible to fulfill his legal duties. He must approve advertising actions carried out by 360 decoro while being aware of competition regulations and taking the whole risk of the implementation of the advertising action. In case of goods delivery, they belong to 360 decoro up to their entire payment. If 360 decoro is a sub-contractor in certain projects but the constructor or contracting entity is not able to meet payment deadlines, 360 decoro reserves the right to extend the proprietary rights to the end-consumer or to the first contracting entity. All kinds of faults or damages of the delivered products must be reported to 360 decoro on a written basis within 7 days with exact decription of the damage. The customer is committed to store the product until jurisdictional hearing of evidence. Otherwise the notice of defect is not valid. In case of a real damage caused by 360 decoro we reserve the right to offer improvement, extension of missing features or replacement of the product instead of price reduction at first instance. Colour differences that are based on technical reasons as well as colour changes due to UV, climate or age are not considered to be defects. The customer accepts in advance that these difficulties may occur because we clearly point out that colour difference is a characteristic of the printing process which cannot be influenced from outside. That is why the notice of defects and any other further costs in these cases cannot be accepted. Other than that customers must be aware that not calibrated monitors and printers also provoke colour differences. Colours can just be guaranteed when providing a colour-binding proof (Fogra). Hard copies of printers do not belong to any norm. Also the picture on the screen does not correspond to the final print. Further, colour variation can occur in case of reorder or provision of samples due to production conditions. Any kind of complaints in this case are not being accepted. If the customer delivers the material to 360 decoro, it is clearly agreed that we are not liable for the outcome of the product because the flawless products cannot be warranted when material is provided by the customer. Finally, all damages that occur during shipment of the product by an external transportation company are not the responsibility of 360 decoro. Notice of defect is completely impossible. 360 decoro starts to take care of a project as soon as the entire payment is done. We reserve the right to deny the order process unless the money has not been delivered in time. We accept cash, cheque payment as well as online bank transfer. In case of online banking please note that the process will be started after we received the bank confirmation. In case of delayed payment by the customer we are not held responsible for any failed deadlines concerning the finalisation of the project. In addition, the customer undertakes to repay the costs of dunning letters, encashment, survey and information costs, in particular costs for lawyers. The place of performance concerning deliveries and payments is the official location of the company (Austria, Germany, UK, UAE, Hong Kong). It is clearly accepted that the UN Convention on contracts for the International Sale of Goods is not applicable. If any regulation of the present general terms and conditions is completely or partly not legally effective or going to lose its legal effectivity, the validity of the other terms is not affected. For the legally non-effective regulations the parties of this contract agree to find other legally effective terms that are similar to the non-effective ones in reference to the purpose of the term. This is also applicable for non-predictable gaps in the contract.